Find your dock in the dark. These industrial strength lights will add lighting to your walkway allowing you to see it from your boat without any apprehension. You'll be able to confidentally pull up to the dock in even the lowest light conditions, due to the solar power of this amazing light. 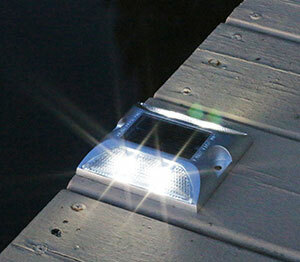 These lights are reflective to add safety to your dock as well. Made from anodized aluminum for use in any harsh marine enviroments. These will even resist salt water and harsh sun exposure.